This week is the last day of Guest Week here at FCT, and I’m inviting friends and supporters of the site to craft some of their own questions! Today, we have questions from Mike Nothnagel, a math professor at the Culinary Institute of America from Poughkeepsie, New York. He is also the residential quizzer of WAMC’s segment “Any Questions?“, which was the inspiration of today’s set. A fellow wordplay enthusiast, he has also written a challenge that you can participate in for a chance to win Five Course Trivia swag! Everything after this point was written by him. Enjoy! 1. In a commercial officially titled “Fluffy Bun,” three elderly women inspect a comically-large hamburger bun. After the top half of the bun is lifted, an outraged Clara Peller asks what question? 2. What question follows these commercial jingle lyrics: “For that chocolate-y coated ice cream, loaded big and thick, no room for a stick”? 3. A 1993 commercial – the first in a series that continued through 2014 – features a history buff who calls into a radio station to answer a trivia question about Alexander Hamilton, but his response is unintelligible because he’s just eaten a peanut butter sandwich. What two-word slogan appears at the end of this commercial? 4. In a commercial that first aired in 1969, a young boy asks Mr. Owl, “How many licks does it take to get to the Tootsie Roll center of a Tootsie Pop?” In addition to the owl, the original 60-second version of the ad shows the boy asking a cow, a fox, and what animal, which also appears in the 30-second version? 5. A scene from a commercial in which an aristocrat in a Rolls-Royce asks another aristocrat in a Rolls-Royce, “Pardon me, but would you have any Grey Poupon?” is referenced in the video for the 2017 song “Humble”, the lead single from the album Damn by what artist? BONUS: Start with the phrase TELEVISION AD. Change one letter to a G and you can rearrange the result to spell a six-letter word for a type of cooking pot (or a dish cooked in such a pot) and a six-letter word for things that might be included in a dish cooked in such a pot. What are the words? 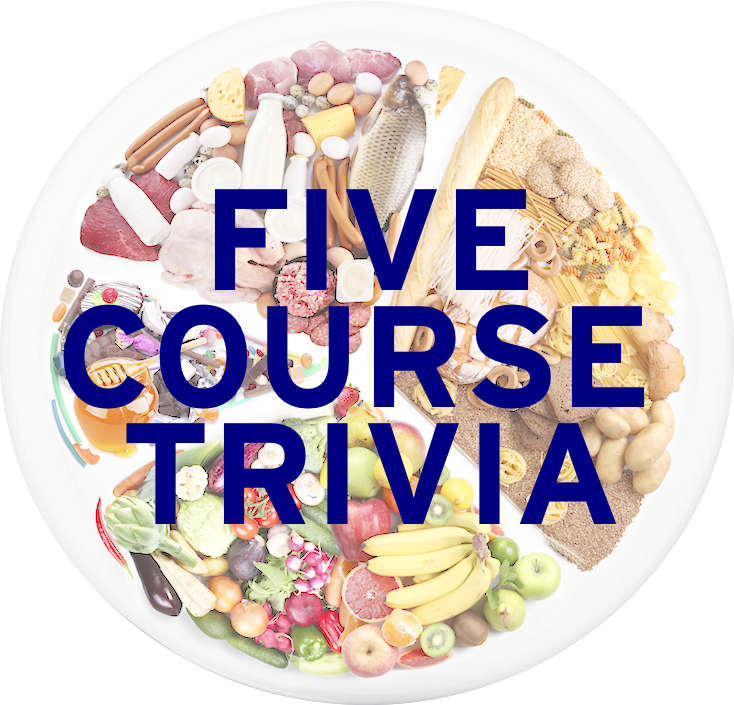 When you have your answer to the BONUS question, email cking.gow(at)gmail.com, and three submissions will receive an official Five Course Trivia coaster, hopefully to be finished by the end of summer! Submissions will be accepted until Monday, August 28th at 11:30. Thanks again to Mike for crafting today’s questions! Well, that’ll do it for Guest Week, and once again, I want to thank all five of our guest writers that are now all officially friends-of-the-show. And on Monday, we got back to our regularly scheduled program with yours truly writing the questions. Thanks everyone, and have a great weekend! 1. “Where’s the beef?” Apparently, Peller was supposed to say “Where is all the beef?” but couldn’t because of her emphysema. A year later, she found the beef in a commercial for Prego pasta sauce. 2. “What would you do for a Klondike bar?” Among the things people were willing to do: make monkey sounds, act like a chicken, and pretend to be a teapot. 3. “Got milk?” This commercial is recreated* in its entirety during Act Two of Hamilton. 4. A turtle. Mr. Turtle was voiced by Ralph James, who played Mork’s boss Orson on Mork & Mindy. 5. Kendrick Lamar. Other references to the famous mustard-passing scene have appeared in Wayne’s World, The Simpsons, and the classic 1991 Michael J. Fox film The Hard Way.